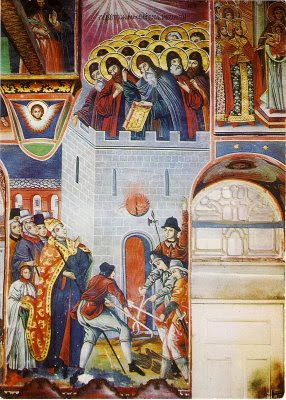 The Papists, who never stopped fighting to subjugate the Orthodox under the dominion of the Pope, went to Mount Athos in 1274 A.D. to serve in the struggle to impose Papism in any way, because "the Pope wanted to subjugate the Eastern Church and to fulfill the big dream of Papism, which is one Church under the authority of the Pope" (Nikos Zacharopoulos). 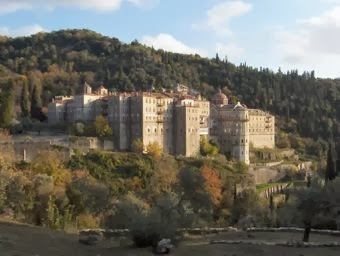 The monks of Mount Athos, despite intense pressure and torture, remained firm in the Orthodox faith. Unfortunately, however, the Monasteries of Great Lavra and Xeropotamou succumbed to the threats and submitted to the Pope. This made the Papists believe they could expand their dominance throughout Mount Athos. Their next goal was the Sacred Monastery of Zographou near which a certain monk was struggling in the ascetic life, who had the blessed habit of reading daily, before the icon of the Theotokos, the Akathist Hymn. One day, as soon as the monk said: "Rejoice, bride unwedded", he heard the Panagia say to him: "Rejoice thou also, servant of God". She then told him that the Papists were on their way to the Sacred Monastery of Zographou and urged him to notify the monks. As a result, some monks dispersed and hid in a cave. However, twenty-six monks, together with their abbot, gathered together in the tower of the Monastery. The Papists tried first with flattery and then with threats to convince them to open the Monastery and liturgize together with them. Because they refused to do so, they were burned alive. First, the One, Holy, Catholic and Apostolic Church is what we confess in the Symbol of Faith, which is the Orthodox Church, that received the faith as it was revealed by Christ and given by the Apostles, and through her true members, the Saints, it preserves unadulterated. The Saints, because they reached theosis and know God empirically, can discern between that which is created and that which is uncreated, truth from error, the divine from the demonic. Also, they know very well, that when the faith is altered, a person's way of life is altered, and the method of treatment of the passions is lost putting their salvation at stake. Latin-speaking inhabitants of the Western Roman Empire (Byzantium) were members of the Orthodox Church, "until the Franks conquered by force the Patriarchate of Rome and permanently settled their own Pope (probably from 1009 onward). Only then, when a Frank took over the papal throne, did the Popes begin supporting the Filioque and juxtaposed the Orthodoxy of the four remaining Patriarchates" (Anastasios Philippides). At present we will not analyze the Filioque (and from the Son), which means that the Holy Spirit also proceeds from the Son, as well as the other heretical doctrines introduced by the Franks, that resulted in their secession from the One, Holy, Catholic and Apostolic Church. What can be noted here is that "the heretical doctrine of the Filioque is based on another serious heresy which teaches that the energies of God are created. But we know from Holy Scripture and the teachings of the Holy Fathers that God is uncreated and both His essence and energies are uncreated. Only created things have a created essence and created energies, and these are creations of God. If the energies of God are created, this means also that the essence of God is created, which means man cannot be saved, since something created cannot save something else created. The uncreated God saves created man. Gregory Palamas, in uncovering the heretical teachings of Barlaam, stresses the fact that God is uncreated in His essence and uncreated in His energies. His essence is unknowable, but He can be known through His uncreated energies, which is Grace, wisdom, philanthropy, His goodness, etc." (Metropolitan Hierotheos of Nafpaktos). Also, when the Orthodox teachings in the West were altered by the Franks, the hesychastic way of life was also lost, which was experienced and expressed by many Fathers of the West, such as Saint Jerome, Saint Gregory the Dialogist and Pope of Rome, et al. This teaching led to the purification of the heart from the passions, to the illumination of the nous and to theosis. It was replaced with scholasticism and moralism, that created within people many internal-existential problems that have had adverse impacts on society, as well as the natural environment. Second, martyrdom is directly linked to man's spiritual condition. He who has reached theosis has acquired perfect love and is ready at any moment to sacrifice his life for Him Who first loved us. We speak of perfect love, because there is "small love, middle love and perfect love. Whoever fears sin, loves God. Whoever is devout, loves even more. Whoever has Light and joy in their soul, loves yet even more. And whoever has grace in their soul and body, that person has perfect love. Such grace is given by the Holy Spirit to the Martyrs and by this they bravely endured all pain" (Saint Silouan the Athonite). When we speak about Orthodoxy we must also speak about Orthopraxis, because Orthodoxy is not an ideology, but a way of life and a method of therapy for the passions. It is a continuous journey towards theosis, which is the purpose of our lives. Source: Ekklesiastiki Paremvasi, "ΕΙΚΟΣΙ ΕΞΙ ΜΑΡΤΥΡΕΣ ΜΟΝΑΧΟΙ ΤΗΣ ΙΕΡΑΣ ΜΟΝΗΣ ΖΩΓΡΑΦΟΥ", October 2008. Translated by John Sanidopoulos.